I’ve posted here before about Hannah Viano’s first two books: S is for Salmon: A Pacific Northwest Alphabet and Arrow to Alaska: A Pacific Northwest Adventure. Her new book, which will appeal to a larger audience since it is not focused specifically on the Pacific Northwest, provides the same style of colorfully dynamic paper-cut illustrations to teach young kids their letters and about nature at the same time. 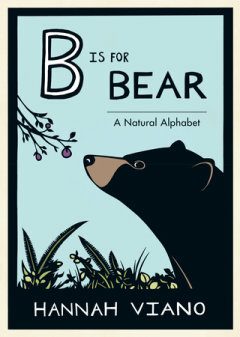 Hannah Viano, B is for Bear: A Natural Alphabet (Seattle: Sasquatch Books, 2015), 32 pp. Publisher’s description A is for Acorn; B is for Bear; C is for Cloud. Celebrated paper artist Hannah Viano has created this beautiful alphabet book that will appeal to children as well as adults. The flora, fauna, and landscape elements in this book are found throughout North America, so readers around the country will connect with Viano’s gorgeous art and text that are both scientific and poetic. My favorite image in the book, however, is for the letter K, which stands for kids. Viano shows several kids climbing in a tree with the caption: “What is another creature that belongs outdoors? Kids!”Yes indeed, humans are animals too, and outdoor time is important for our well-being as any bear or otter. Kudos to Viano for slipping in that little nod to getting more children outside and into nature. And kudos as well for another beautiful nature book for kids.